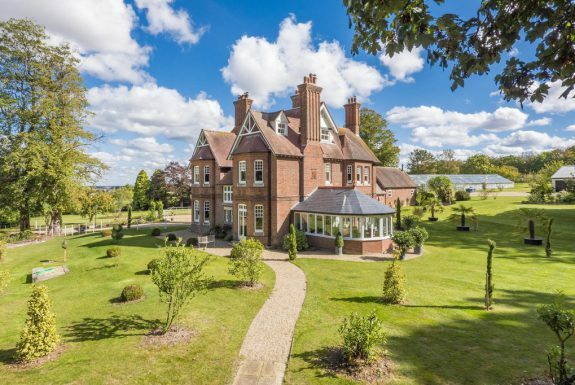 A Victorian country lodge dating from 1880 with beautifully appointed accommodation of approximately 5,700 sq ft. having been extensively refurbished to a high specification returning the property it to its former glory with the benefit of modern technology. The property is set within grounds approximately 5.5 acres. This substantial house occupies an exceptional setting on the outskirts of a popular market town nestled on the Suffolk/Essex border. 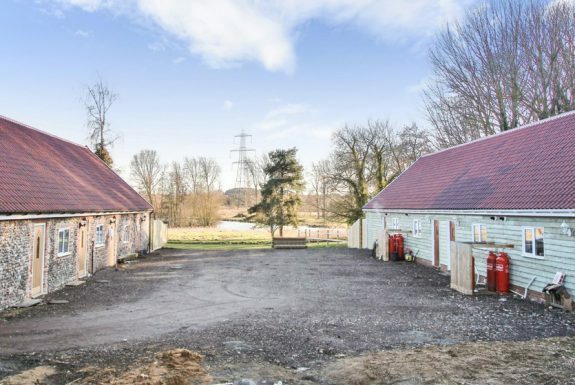 The extensive living accommodation would suit a range of different lifestyles and is further complemented by extensive river frontage, large established grounds and a range of useful outbuildings. In all about 20 acres. Completed to the most exacting of standards, this five bedroom (three en-suite) neo Georgian property offers accommodation in excess of 3,800 sq ft with a stunning 30ft kitchen/breakfast room being of particular note. Benefits include a four-bay carport, gym, sauna, stables, annexe and gardens. In all about 4.6 acre sts. 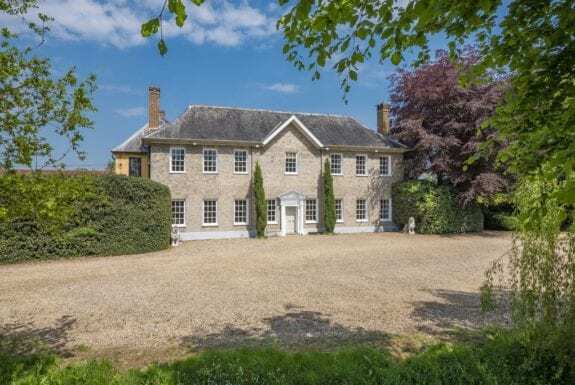 An elegant country house on the outskirts of a highly sought after Suffolk village with extensive grounds, swimming pool and a 3 bedroom guest cottage. The property retains a wealth of character throughout whilst offering practical accommodation that would suit modern living. In all about 26.7 acres. This substantial 7000 sq ft Grade II Listed country home enjoys a wonderful setting on the outskirts of the village convenient for the local amenities. Believed to be 17th Century with later Georgian additions Moor Hall offers stunning period features which are complemented by luxurious recent finishes with the added benefit of a substantial self-contained annexe wing and detached indoor heated swimming pool. The grounds are a particular asset to the property enjoying a parkland setting and are rumoured to have been designed by Capability Brown for his mother who once lived at the property. In all about 5.5 acres. Substantial detached farmhouse with spectacular views offering exceptionally versatile accommodation situated in a no through lane. Detached 3 bedroom annexe, agricultural barn with residential planning consent, 5 bay cart lodge & workshop, formal gardens and grassland. In all about 17 acres sts. This outstanding country house occupies an exceptional setting with stunning far reaching views. The accommodation is divided into two distinct areas including an elegant main house and two further cottages that have previously been used as high end holiday lets. Further benefits include established grounds, a range of useful outbuildings, office and paddocks. In all about 6 acres. 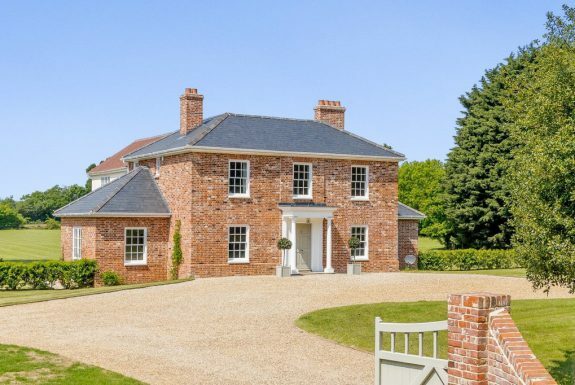 This exceptional Grade II Listed detached residence offers in excess of 6,500 sq ft and is situated on the outskirts of Newmarket convenient for local amenities and road and rail links to Cambridge and London. With strong Arts and Crafts influences the property offers grand, impressive living spaces featuring many unique period features including oak panelling, open fireplaces and decorative carvings. Presented over three floors with extensive cellarage the property offers excellent development opportunity and could easily incorporate a self contained annexe or be divided for dual family living. 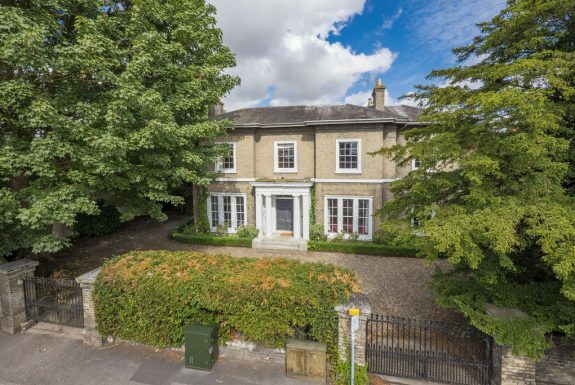 It sits within mature gardens with substantial garage block approached by a sweeping carriage driveway. In all about 1.2 acre. This four-bedroom (one-en suite) detached contemporary residence occupies an enviable setting with no immediate neighbours yet conveniently located for commuting, schools and amenities. 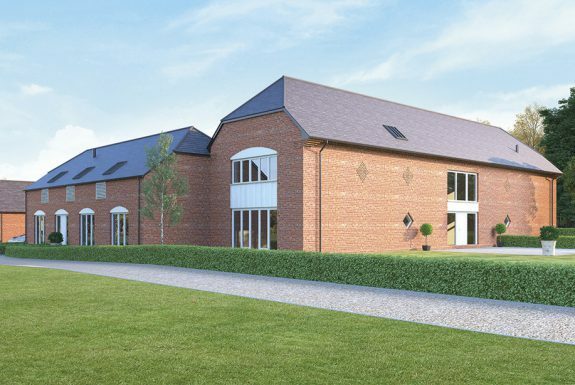 Extensive garaging with studio above, stabling, south facing landscaped gardens and a plot size of approx 6.25 acres. This substantial former Rectory occupies a prominent position in the heart of one of Suffolks most highly regarded villages. 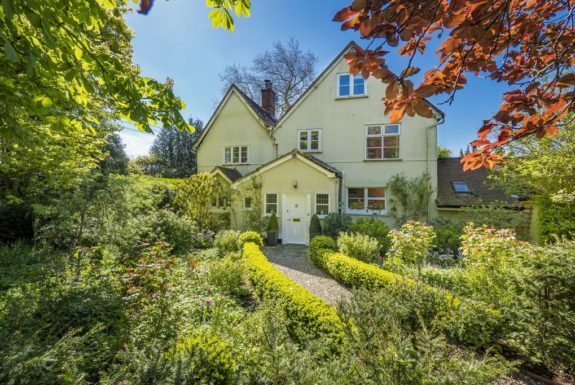 The property requires a degree of updating/decorative attention but nonetheless retains much of its original character with the benefit of a separate coach house/annexe and charming established gardens. In all about 0.43 acres. This substantial part moated conversion offers extensive accommodation that could be utilised as one substantial dwelling or two very well-proportioned homes. The versatile living space combines considerable character with practical modern finishes. There is a purpose built outbuilding which includes double length garaging and a workshop/storage space. In all about 2 acres. An exceptionally well-presented detached house with extensive outbuildings and wonderful established grounds with large lake. The property offers versatile accommodation located on the edge of a highly sought after Suffolk village with far reaching countryside views. In all about 4 acres sts. 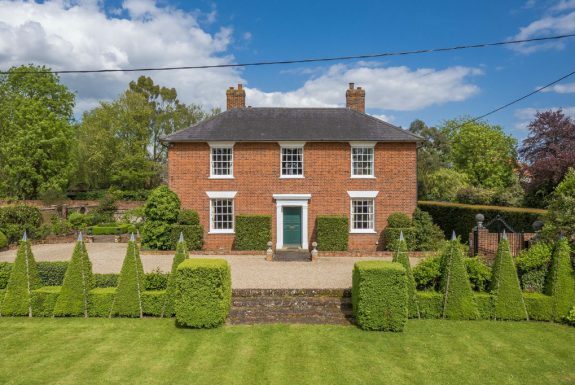 This elegant detached former farmhouse occupies a lovely position on the edge of a well-regarded Suffolk village. The versatile accommodation retains considerable character and has an impressive 38ft kitchen/dining/living room. Useful outbuildings, established grounds, walled garden and a heated swimming pool. In all about 0.8 acres. This substantial 3,990 Sq ft Grade II Listed Tudor Farmhouse occupies an idyllic rural location on the periphery of the town and opposite the popular Nowton Country Park. In all about 3.6 acres. A stunning Grade II listed Essex farmhouse presented in excellent order enjoying a beautiful location offering characterful and versatile accommodation with the benefit of a detached annexe. Extensive equestrian facilities include six stables, manege, paddocks and washing facility. In all about 8.25 acres(sts). Set well back from the road on the outskirts of the ever popular Suffolk village of Lawshall is this individual and substantial detached farmhouse style property boasting accommodation amounting to almost 4,000 sq ft. The property benefits from an extensive range of proportionate reception rooms and therefore offers flexible living ideal for modern day family use. Complementing the versatile ground floor are 5 first floor double bedrooms (2 of which with en-suite) as well as a stylish fitted family bathroom suite. Outside are attractive and well maintained grounds incorporating an ample parking area, as well as detached cartlodge with workshop and sun terrace to the side of the house. Of particular note are the far reaching countryside views which can be enjoyed from many areas of the house and grounds. This outstanding detached house offers light well-balanced accommodation in an elevated setting with grounds abutting countryside and in turn providing far reaching countryside views. Further benefits include a large party barn, heated swimming pool and grounds approaching 3 acres. A five bedroom (two en-suite) detached modern house finished to a high specification and extending to almost 3,000 sq ft of accommodation. Enjoying an open plan aspect with four reception rooms linking seamlessly. Triple garage with office above and total plot size of approximately 1.4 acres. 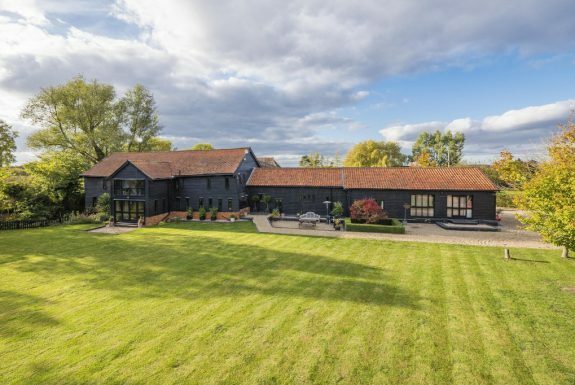 The Long Barn is a spectacularly designed and particularly spacious five bedroom barn conversion that enjoys a plot measuring approximately 2.8 acres. 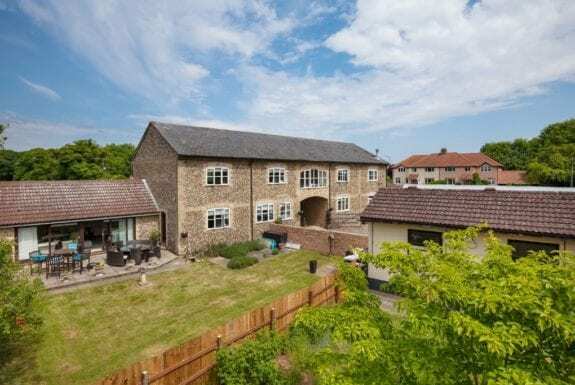 Located on the outskirts of Cowlinge, the property enjoys grand and unique accommodation measuring around 3,200 sq.ft. The property further enjoys gated access, driveway and garage parking with sizeable gardens and paddocks. Flint Barn is a particularly imposing and fantastically presented converted barn occupying a sizeable plot in one of the areas most sought after villages. Boasting accommodation measuring in excess of 5500 sq. ft. the property offers an abundance of space and character. Flint Barn also benefits from twelve stables, outbuildings, paddocks and courtyard parking for several vehicles. In all about 1.7 acres. An attractive and substantial Grade II Listed village home full of light, charm and characterful features situated within delightful grounds with a range of outbuildings and views across adjacent farmland. The property has been sympathetically extended to create spacious and well laid out accommodation featuring exposed timbers, stud work and inglenook fireplaces. In all about 1.4 acres. This exceptional barn conversion occupies an elevated position which in turn affords for stunning far reaching countryside views. The exceptionally well presented accommodation offers considerable versatility and is complemented by a self-contained annexe, large car port/outbuilding, tennis court and formal gardens. In all about 9 acres. This attractive Grade II Listed farmhouse is situated on the outskirts of the village backing onto open countryside. The property has retained many original period features including exposed fireplaces and moulded beams with well-proportioned living accommodation extending to approximately 3,358 sq ft. 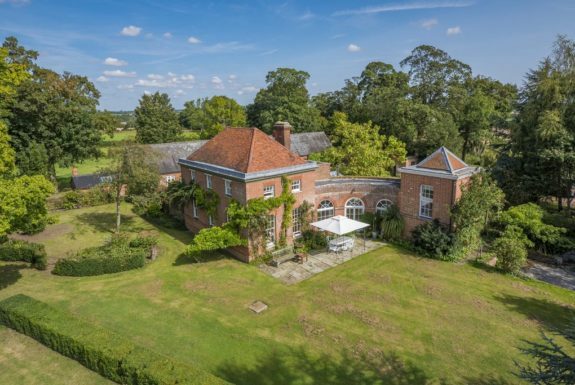 Approached by an impressive sweeping driveway, the property sits within mature gardens incorporating a variety of barns outbuildings which in all measure 5.7 acres. Believed to date from the late 19th Century, Linnet Lodge enjoys a rich history and is thought to have been the original Coach House to the nearby Greene King brewery. Standing proudly on Maynewater Lane with generous gardens to the rear extending down to the edge of the River Linnet. A unique opportunity to acquire splendid holiday accommodation just under 4000 sq ft in total divided into 1 or 2 bedroom units presented to the highest of standards and enjoying an idyllic setting.